She is holder of 45 patents, 23 honorary degrees, and a lengthy list of other honors. She was unmarried. Gertrude Elion was born in New York City on January 23, 1918 to immigrant parents from Eastern Europe. She and her younger brother grew up in the Bronx in New York where they enjoyed playing in the large parks and visiting Bronx Zoo. She completed her graduation from Hunter College, City University of New York with a B.A. degree in chemistry in 1937. During this time she also planned to become a cancer researcher but for several years worked as a lab assistant, food analyst (tested pickles and berries for quality at the Quaker Maid Company), and high school teacher while studying for her Master’s degree at night. She completed her M.S. in chemistry from New York University in 1941. When World War II broke out, there was an urgent need for women at scientific laboratories so she obtained a position initially in instrumentation in an industrial laboratory and then as an assistant to George H. Hitchings at the Burroughs-Wellcome pharmaceutical company (now GlaxoSmithKline). She never obtained a formal doctorate, but was later awarded an honorary doctorate from Polytechnic University of New York in 1989 and honorary SD degree from Harvard University in 1998. While working with George Hitchings, Elion helped develop the first drugs to combat leukemia, herpes, and AIDS, and established new research methods to produce drugs that could target specific pathogens. 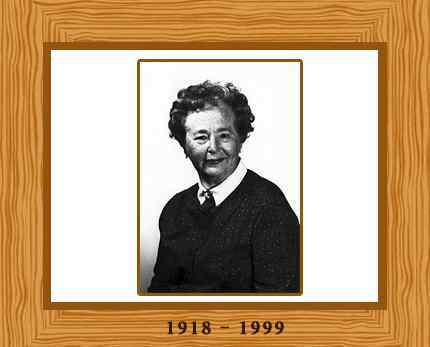 The medicines she developed include acyclovir (for herpes), allopurinol (for gout), azathioprine (which limits rejection in organ transplants), purinethol (for leukemia), pyrimethamine (for malaria), and trimethoprim (for meningitis and bacterial infections). During 1967 she occupied the position of the head of the company’s Department of Experimental Therapy and officially retired in 1983. Despite her retirement, Elion continued working almost full time at the lab, and oversaw the adaptation of azidothymidine (AZT), which became the first drug used for treatment of AIDS. Gertrude Elion died in North Carolina on February 21, 1999. She was always admired by a number of students and colleagues for her brilliancy and dedication to science.